Defining Disease in a Prospective Cohort of South African Miners ... of Mycobacteriology, South African Institute of Medical Research, ... Wellcome Trust. ...... Acknowledgment : The writers gratefully acknowledge Carol Van Blomme-. Med 2013;19:662â9. Martiniano SL, Sontag MK, Daley CL, Nick JA, Sagel SD. Clinical · significance of a first positive nontuberculous mycobacterial culture in. Molecular epidemiology of nontuberculous mycobacteria. Wendt SL, George KL, Parker BC, Gruft H,. Falkinham JO III: Epidemiology ..... BMC. Microbiol. 8, 204 (2008). 67. Motiwala AS, Strother M, Amonsin A et al.:. 2Institute of Transplantation, Freeman Hospital, Newcastle upon Tyne. Hospitals NHS .... centre based decisions on results from cough swabs. Tissot et al. 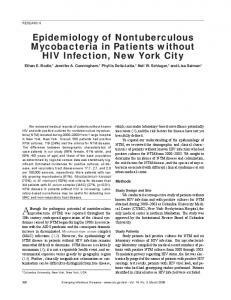 HIV Infection, New York City. Ethan E. ... were compared with those of the New York Public Health ..... City of New York Department of Environmental Protection. Apr 2, 2015 - National Taiwan University College of Medicine, Taipei, Taiwan. 5Department of ... ing translational studies to develop precision medicine in. Dec 8, 2018 - growing mycobacteria (RGM).4 Mycobacterium chelonae,. Mycobacterium .... likelihood method with 1,000 bootstrap replications. The phy- logenetic ... ate, and resistant), we referred to the MIC breakpoints of ..... liquid media. 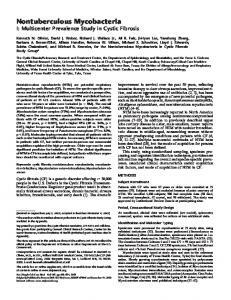 of mycobacterial culture and the use of Xpert MTB/RIF to .... manual system (Becton Dickinson, Sparks, MD, USA) and the second by using ..... Loss of weight. 753 (63.4) .... This prac- tice might pose a challenge for national TB programs in. For optimal recovery of mycobacteria, clinical specimens from nonsterile body sites .... Data from List of prokaryotic names with standing in nomenclature. ..... fluorochrome stains may stain other bacteria damaged by antituberculous drugs at. May 16, 2004 - In total, 12 patients (8.6%) had positive cultures and six (4.3%) met the criteria for NTM ... accentuate important differences in prognosis,. Oct 25, 2016 - [email protected], [email protected]). Abstract ... Citation: Honda JR, Hasan NA, Davidson RM, ..... a) None. Pearl City, Oahu. 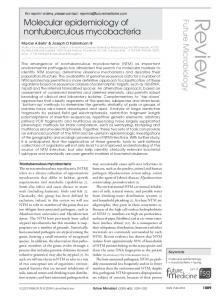 JOURNAL OF CLINICAL MICROBIOLOGY, Apr. 2001, p. 1396–1401 0095-1137/01/$04.00⫹0 DOI: 10.1128/JCM.39.4.1396–1401.2001 Copyright © 2001, American Society for Microbiology. All Rights Reserved. Phospholipase C plays a key role in the pathogenesis of several bacterial infections, for example, those caused by Clostridium perfringens and Listeria monocytogenes. Previous studies have reported multiple copies of plc genes homologous to Pseudomonas aeruginosa plcH and plcN genes encoding the hemolytic and nonhemolytic phospholipase C enzymes in the genomes of Mycobacterium tuberculosis, M. marinum, M. bovis, and M. ulcerans. In this study we analyzed the possible relationship between phospholipase C and hemolytic activity in 21 strains of nontuberculous mycobacteria representing nine different species. Detection of phospholipase C enzymatic activity was carried out using thin-layer chromatography to detect diglycerides in the hydrolysates of radiolabeled phosphatidylcholine. DNA sequences of M. kansasii and M. marinum homologous to the genes encoding phospholipase C from M. tuberculosis and M. ulcerans were identified by DNA-DNA hybridization and sequencing. Finally, we developed a direct and simple assay to detect mycobacterial hemolytic activity. This assay is based on a modified blood agar medium that allows the growth and expression of hemolysis of slow-growing mycobacteria. Hemolytic activity was detected in M. avium, M. intracellulare, M. ulcerans, M. marinum, M. tuberculosis, and M. kansasii mycobacteria with phospholipase C activity, but not in M. fortuitum. No hemolytic activity was detected in M. smegmatis, M. gordonae, and M. vaccae. Whether or not phospholipase C enzyme plays a role in the pathogenesis of nontuberculous mycobacterial diseases needs further investigation. ronmental sources, including water, soil, and dust (6), and some of these mycobacteria are opportunistic pathogens. Nontuberculous mycobacteria, including M. kansasii and M. avium-M. intracellulare complex, cause pulmonary disease (1, 4, 41). M. avium causes cervical lymphadenitis in children (14, 15), while M. marinum and M. ulcerans have been found to cause skin disease (5, 17, 43). The incidence of nontuberculous mycobacteria has increased since the first reports of nontuberculous mycobacterial disease in immunocompromised hosts in 1982 (40, 42). The impact of nontuberculous mycobacterial infections in AIDS patients poses a major challenge to physicians and mycobacteriologists. These challenges include the development of antimicrobial agents with efficacy in prophylaxis and therapy for nontuberculous mycobacterial infections and the identification of the virulence mechanisms of these mycobacteria. In some infections caused by opportunistic mycobacteria, anemia has been found to be an important negative predictor for survival (2, 10, 29). In the present study we have investigated the possible relationship between phospholipase C and hemolytic activity in nontuberculous mycobacteria by attempting to detect genes encoding phospholipase C as well as phospholipase C and phospholipase D activities in vitro in nine isolates of these mycobacteria. Finally, we have devised a blood agar test as a simple procedure to screen for the presence of hemolytic activity either produced by phospholipase C or produced by other equivalent enzymes related to pathogenicity. TABLE 1. List of mycobacterial strains studieda ITM strain no. M. M. M. M. M. M. M. M. M. M. M. M. M. M. M. M. M. M. M. M. M. M.
a ITM, Institute of Tropical Medicine; ATCC, American Type Culture Collection; DRC, Democratic Republic of Congo. PLC, phospholipase C; PLD, phospholipase D; SB, Southern blot; HA, hemolytic activity. b ⫹, positive; N, negative. FIG. 1. Autoradiography of thin-layer chromatography results showing phospholipase C and phospholipase D activity of whole-cell extracts on the radiolabeled phosphatidylcholine L-␣-1-palmitoyl-2linoleoyl-(linoleyl-1-14C). The solvent system included petroleum ether, ethyl ether, and acetic acid (50:50:1). Lanes: L1, H2O (negative control); L2, phospholipase C control (phospholipase C from C. perfringens [Sigma, Bornem, Belgium]); L3, phospholipase D control (phospholipase D type I from cabbage [Sigma]); L4 to L9, M. avium isolates 98-920, 98-922, 98-924, 98-925, 98-926, and 98-927, respectively. and shaken vigorously. Next, 1 ml of glycerol was added to the solution, and the mixture was heated at 80°C and stirred for 30 min. The medium was supplemented with 20 ml of 5% bovine serum albumin; 10 ml of defibrinated horse or sheep blood was added and mixed by gentle shaking. Then, 5 ml of the medium was dispensed into each petri dish quadrant and left to dry. The plates were stored at 4°C until inoculation. We prepared mycobacterial suspensions in PBS (pH 7.3) with an inoculum from the Lowenstein-Jensen medium. Aliquots of 100 ml corresponding to McFarland standards 1, 5, and 10 (10) were spread on the blood agar plates. 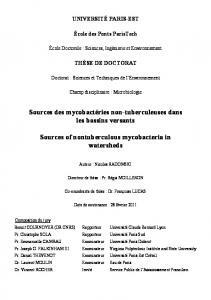 All mycobacteria were incubated at 37°C, except for M. ulcerans and M. marinum, for which a temperature of 33°C was used. All bacteria were grown under aerobic, microaerophilic (CampyPAK Plus, microaerophilic system envelope with a palladium catalyst system; Becton Dickinson, Cockeysville, Md. ), and anaerobic conditions (Gas Pak Plus anaerobic system, envelopes with a palladium catalyst; Becton Dickinson). Incubation periods were 1 week for fast-growing mycobacteria and 3 to 4 weeks for slow-growing mycobacteria. Hemolytic activity was considered to be positive when a clear zone was observed around isolated colonies. The hemolytic assay was repeated three times for each mycobacterial strain. FIG. 2. Southern hybridization using the plc probe. Genomic DNA from each mycobacterial strain was digested with PvuII and probed with the plc probe. There is evidence of hybridization with M. kansasii 96-1073 (lane 3) M. marinum 7732 (lane 6), M. bovis 96-319 (lane 7), M. tuberculosis 8251 (lane 8), and M. ulcerans strains 5147 and 94-1326 (lanes 9 and 10). No hybridization is seen with M. smegmatis 4995 (lane 2), M. avium 1104 (lane 4), and M. intracellulare 4199 (lane 5). ␭ HindIII DNA marker is in lane 1. Sizes are given in kilobase pairs. FIG. 3. Hemolytic activity in horse and sheep blood agar medium. The hemolytic activity of M. tuberculosis 8251 (Q2, sheep blood), M. ulcerans 5147 (Q3, horse blood), and M. avium 98-922 (Q4, horse blood), with clear zones of hemolysis surrounding the growth of the bacteria, is shown. Although extensive growth is observed in M. smegmatis MC2/155 (Q1, horse blood), there are no clear zones and, hence, there is no hemolytic activity. prolonged exposure of the autoradiograph (Table 1). Phospholipases produced by pathogenic bacteria have been shown to play a variety of roles in the pathogenesis of disease (30, 33, 35). The plc genes identified in M. tuberculosis have significant homology with the P. aeruginosa plcH and plcN genes encoding the hemolytic and nonhemolytic phospholipases C (16, 19). In this study a DNA-DNA hybridization assays using a phospholipase C probe from M. ulcerans showed putative plc genes in three mycobacterial isolates with phospholipase C enzymatic activity; however, we were not able to detect hybridization patterns for M. avium and M. intracellulare (Fig. 2). A preliminary hybridization assay using a phospholipase C probe from M. tuberculosis with 76% identity to the phospholipase C probe from M. ulcerans was negative as well (data not shown). These findings may be related to the fact that the M. avium genome is phylogenetically more distant from M. tuberculosis than the other slow growers tested here, when compared by 16S rRNA sequences. When screened for hemolysis, all phospholipase C-positive mycobacterial isolates were found to be hemolytic (Table 1); however, among the phospholipase C-negative isolates only M.
fortuitum was hemolytic. Interestingly, M. fortuitum was shown by Udou (36) to possess an extracellular hemolytic activity that was stable after heating and proteinase treatment, suggesting the presence of a nonprotein hemolysin. The design of our phospholipase C probe has been based on the comparison between mpcA and mpcB gene sequences from M. tuberculosis (GenBank accession no. U49511) (19) and genes coding nonhemolytic plcN and hemolytic plcH from P. aeruginosa (GenBank accession no. M59304 and M13047) (24, 26). We speculate that the phospholipase C produced by mycobacterial isolates with plc genes homologous to P. aeruginosa may have a similar function. Furthermore, several studies suggest that the ability of some bacterial phospholipases to cause hemolysis is due to their ability to hydrolyze both phosphatidylcholine and sphingomyelin (24, 35). The fact that mycobacterial phospholipase C is able to hydrolyze membrane phospholipids, yielding DAG (Fig. 1), suggests a role for these enzymes in the pathogenesis of some mycobacterial infections (7, 21). Furthermore, ceramides are key mediators in coordinating cellular responses and are generated via the sphingomyelinase pathway which, in turn, is activated by the phospholipase C product DAG (32). The hemolytic activity assay that we have developed for slow-growing mycobacteria is a qualitative test, which we believe can detect weak hemolytic substances that may require several days for erythrocyte lysis. However, the hemolysis detected does not depend exclusively on the time of incubation since strong hemolysis was detected in the fast-growing organism M. fortuitum after 4 days and no hemolytic activity was detected with the slow-growing organism M. gordonae after 6 weeks of growth on blood agar. Among several comparative reports on hemolytic activity between mycobacterial isolates (18, 36), only one showed a possible link between hemolytic activity and pathogenicity (28). Rudnicka et al. observed that weak hemolytic M. avium strains induced more intensive production of nitric oxide and were more susceptible to bactericidal effects caused by infected murine macrophages. In contrast, strongly hemolytic isolates induced significantly stronger tumor necrosis factor alpha production by infected macrophages than weakly hemolytic bacilli. In our study, phospholipase D activity was detected in all mycobacterial isolates analyzed (Table 1); however, whether or not phospholipase D enzymatic activity in mycobacteria plays a role in pathogenesis is, as yet, not established. In conclusion, we analyzed the possible relationship between phospholipase C and hemolytic activity in nontuberculous mycobacteria. We demonstrated for the first time the production of hemolysis of various mycobacterial isolates in horse and sheep blood agar solid medium. This simple visual assay for hemolytic activity could provide an efficient tool for screening mycobacterium genome libraries for hemolytic and cytolytic factors. Mycobacterial plc gene expression could be related to hemolysis and pathogenesis, as has been demonstrated for similar genes in P. aeruginosa. We found a positive correlation between the presence of phospholipase C enzymatic activity and the hemolytic activity in the mycobacterium isolates we evaluated; however, since the hemolysis induced by mycobacteria appears to result from multiple factors, further investigations on this topic are required. pholipase C regulates activation of p42/44 mitogen-activated protein kinase in lipopolysaccharide-stimulated human alveolar macrophages. J. Immunol. 162:3005–3012. Naylor, C. E., M. Jepson, D. T. Crane, R. W. Titball, J. Miller, A. K. Basak, and B. Bolgiano. 1999. Characterization of the calcium-binding C-terminal domain of Clostridium perfringens alpha-toxin. J. Mol. Biol. 294:757–770. Ninomiya, M., O. Matsushita, J. Minami, H. Sakamoto, M. Nakano, and A. Okabe. 1994. Role of alpha-toxin in Clostridium perfringens infection determined by using recombinants of C. perfringens and Bacillus subtilis Infect. Immun. 62:5032–5039. Ostroff, R. M., A. I. Vasil, and M. L. Vasil. 1990. Molecular comparison of a non-hemolytic and a hemolytic phospholipase C from Pseudomonas aeruginosa. J. Bacteriol. 172:5915–5923. Otnaess, A. B., C. Little, K. Sletten, R. Wallin, S. Johansen, R. Flensgrud, and H. Prydz. 1977. Some characteristic of phospholipase C from Bacillus cereus. Eur. J. Biochem. 79:459–468. Pritchard, A. E., and M. L. Vasil. 1986. Nucleotide sequence and expression of a phosphate-regulated gene encoding a secreted hemolysin of Pseudomonas aeruginosa. J. Bacteriol. 167:291–298. Rahme, L. G., E. J. Stevens, S. F. Wolfort, J. Shao, R. G. Tompkins, and F. M. Ausubel. 1995. Common virulence factors for bacterial pathogenicity in plants and animals. Science 268:1899–1902. Rudnicka, W., M. Brzychcy, M. Kink, A. G. Lopez, P. A. Fonteyne, S. Rusch-Gerdes, and B. Rozalska. 1999. The production of nitric oxide and tumor necrosis factor by murine macrophages infected with mycobacterial strains differing by hemolytic activity. Microbiol. Immunol. 43:637–644. Sathe, S. S., P. Gascon, W. Lo, R. Pinto, and L. B. Reichman. 1990. Severe anemia is an important negative predictor for survival with disseminated Mycobacterium avium-intracellulare in acquired immunodeficiency syndrome. Am. Rev. Respir. Dis. 142:1306–1312. Schluter, D., E. Domann, C. Buck, T. Hain, H. Hof, T. Chakraborty, and M. Deckert-Schluter. 1998. Phosphatidylcholine-specific phospholipase C from Listeria monocytogenes is an important virulence factor in murine cerebral listeriosis. Infect. Immun. 66:5930–5938. 31. Schmiel, D. H., and V. L. Miller. 1999. Bacterial phospholipases and pathogenesis. Microbes Infect. 1:1103–1112. 32. Schwarzer, N., R. No ¨st, J. Seybold, S. K. Parida, O. Fuhrmann, M. Krull, R. Schmidt, R. Newton, S. Hippenstiel, E. Domann, T. Chakraborty, and N. Suttorp. 1998. Two distinct phospholipases of Listeria monocytogenes induce ceramide generation, nuclear factor-␬B activation and E-selectin expression in human endothelial cells. J. Immunol. 161:3010–3018. 33. Songer, J. G. 1997. Bacterial phospholipases and their role in virulence. Trends Microbiol. 5:156–161. 34. Terada, L. S., K. A. Johansen, S. Nowbar, A. I. Vasil, and M. L. Vasil. 1999. Pseudomonas aeruginosa hemolytic phospholipase C suppresses neutrophil respiratory burst activity. Infect. Immun. 67:2371–2376. 35. Titball, R. W. 1993. Bacterial phospholipases C. Microbiol. Rev. 57:347–366. 36. Udou, T. 1994. Extracellular hemolytic activity in rapidly growing mycobacteria. Can. J. Microbiol. 40:318–321. 37. Vazquez-Boland, J. A., C. Kocks, S. Dramsi, H. Ohayon, C. Geoffroy, J. Mengaud, and P. Cossart. 1992. Nucleotide sequence of the lecithinase operon of Listeria monocytogenes and possible role lecithinase in cell-cell spread. Infect. Immun. 60:219–230. 38. Vincent, L.-F., and F. Portaels. 1992. 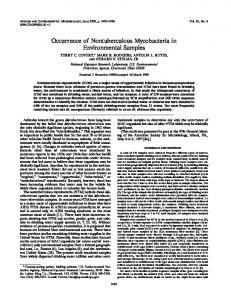 Proposed minimal standards for the genus mycobacteria and for description of a new slowly growing Mycobacterium species. Int. J. Syst. Bacteriol. 42:315–323. 39. Wadsworth, S. J., and H. Goldfine. 1999. Listeria monocytogenes phospholipase C-dependent calcium signaling modulates bacterial entry into J774 macrophage-like cells. Infect. Immun. 67:1770–1778. 40. Wolinsky, E. J. 1979. Nontuberculous mycobacteria associated disease. Am. Rev. Respir. Dis. 119:107–159. 41. Yamazaki, Y., K. Kubo, A. Takamizawa, H. Yamamoto, T. Honda, and S. Sone. 1999. Markers indicating deterioration of pulmonary Mycobacterium avium-intracellulare infection. Am. J. Respir. Crit. Care Med. 160:1851–1855. 42. Zakowski, P., S. Fligiel, G. W. Berlin, and L. Johnson, Jr. 1982. Disseminated Mycobacterium avium-intracellulare infection in homosexual men dying of acquired immunodeficiency. JAMA 248:2980–2982. 43. Zeligman, I. 1972. Mycobacterium marinum granuloma: a disease acquired in the tributaries of the Chesapeake Bay. Arch. Dermatol. 106:26–31. 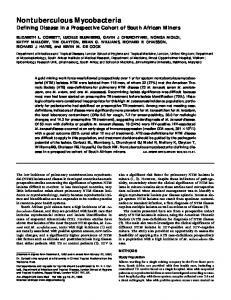 Report "Detection of Phospholipase C in Nontuberculous Mycobacteria and Its ..."